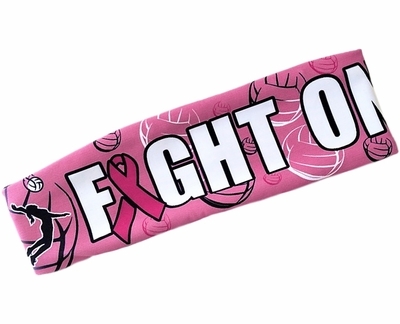 FIGHT ON Pink Ribbon Volleyball Player Printed Spandex Fabric Elastic Head Bands are a great Hair Accessory for Women, Men, Boys, and Girls of all ages to Show Your Support For Breast Cancer Awareness! Please Note: Limited Quantities Available. Clearance Merchandise Is Non-Returnable. Bright & Colorful FIGHT ON Pink Ribbon Printed Spandex Head Bands are composed of an 80% polyester / 20% lycra spandex blend fabric with a black jersey fabric interior lining and an elastic band in the back to help them stay in place. This Performance Activewear fabric is Moisture Wicking, Antibacterial, UV protected, and offers a 4-way Stretch for optimal comfort and durability. Relaxed Dimensions: 3" Tall in the Front tapering to 1.5" Tall in the Back and 20" Around. Fabric Care: Hand-Wash in Cold Water and Hang-Dry . . . Do Not Iron or Bleach. 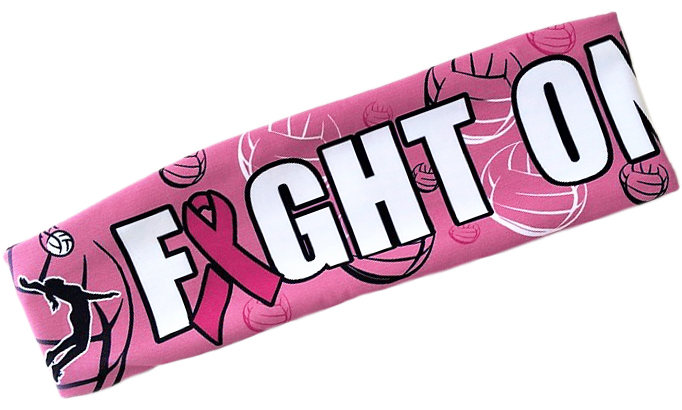 These Cancer Awareness Fight On Pink Ribbon Printed Spandex Fabric Headbands will show your Support For The Cause during all your team volleyball games & activities. Complete the form below to submit your question about this product. Average response time is within 24 hours (longer on weekends).